The Chinese have a rich history in New Zealand and are amongst our earliest settlers - with large numbers arriving in the 1850s for the gold rush. There have been some awesome books written about early Chinese. In our Family History research guide on our website, we highlight the famous books Windows on a Chinese Past written by James Ng and Unfolding history, evolving identity, the Chinese in New Zealand by Manying Ip. However, we also have several books in our collection written by other authors and researchers such as Helen Wong's In the mountain's shadow : a century of Chinese in Taranaki 1870 to 1970 = Zai shan de yin ying : yi ge shi ji han ren Taranaki 1870 dao 1970 and To be Jungseng in New Zealand : descendants of Jungseng villagers who migrated to New Zealand from 1890. Search in our catalogue using keywords "Chinese" and "New Zealand" for many other titles. 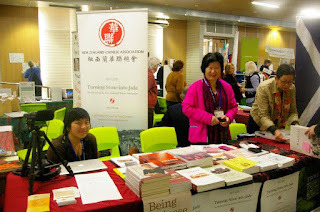 At the Auckland Family History Expo in August 2016, the Chinese community of researchers had their own table, where they displayed many of the books that they had published. The Chinese Poll Tax Heritage Trust has commissioned a project to research and produce a book about the history of Chinese owned and operated laundries in New Zealand, from the first laundries in the 1890s to the 1960s and 1970s when few remained. They want to ensure that this significant part of New Zealand's social history is not lost. This project aims to preserve their memories of those times. Joanna Boileau, phone (09) 528 1174 or 0226 710 334, or by email.